What exactly is a "lease"? Full Lease- In the full lease situation, the lessee pays for all the horse's boarding costs in addition to routine farrier and veterinary care (if showing) in return for being able to use the horse whenever you'd like. The restrictions on the full lease are much less than on a share-lease (half lease), where the owner and lessee must communicate frequently about the shared details. The full lease does not restrict riding times (except for barn hours) and days, and also does not restrict access to the horse for special events such as horse shows. Share Lease- The share lease situation is less expensive than leasing a horse completely by yourself, but still allows you usually 3 days per week to work the horse. In the share-lease, boarding expenses are split between two individuals (horse owner and lessee), in exchange for the lessee to care and ride for the horse 50% of the time. If you'd like to get involved in a share-lease, be sure that everything is clearly understood and written in a contract first. This includes how much is paid in expenses by each individual, schedules for the split riding time and special occasions such as horse shows, and who is responsible for the routine care of the horse. Farrier fees are usually paid for by lessee or split between the lessee and owner. Depending on your particular situation, you can decide whether leasing is a suitable option for you. The most common reason a person would lease a horse instead of buy one is that leasing allows you to experience the joys and responsibilities of horse ownership without actually having to buy a horse, and without having to deal with certain liabilities. Our leasing program is like no other! We are easy going, offer a lesson if needed and are probably the coolest barn people around, with our "zero tolerance" to drama! We are more like family, than just the "barn people". 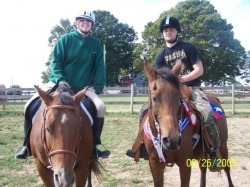 Share Lease- $125/month and includes 3 days of riding time, 1 free lesson a month (with 3 pre-paid lessons only), use of tack (with $75 non-refundable fee) or use your own tack and opportunity to show! We split fuel cost when going to shows, most shows are local so it doesn't cost much! Lessee is responsible for show fees, farrier (bi-monthly) and any other special services not included. Full Lease- $250/month and includes unlimited riding time, 2 free lessons a month (with 2 pre-paid lessons only), use of tack (with $75 non-refundable fee) or use your own tack and opportunity to show! We split fuel cost when going to shows, most shows are local so it doesn't cost much! Lessee is responsible for show fees, farrier (bi-monthly) and any other special services not included. 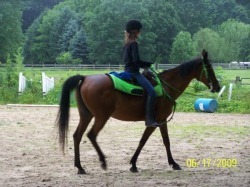 See Meet Our Horses/Ponies to view our availabe horses for lease.